This wide-ranging species has become extirpated from at least one state and may be declining in others, however, there is little data to show that it has markedly declined throughout its wide range as other populations (Tennessee, Minnesota) have shown some expansion. It is distributed from Wisconsin, Minnesota, and South Dakota, south through Iowa, and Kansas to the Gulf states, east to Alabama, Tennessee, Kentucky and Indiana; and recently in Oklahoma. It is apparently extirpated from Ohio. 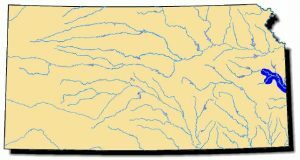 It occurs from the Interior Basin (Mississippi and Ohio River Drainages) south and west to the Colorado River, Texas. Comments: The rock pocketbook has a dark, greenish-brown to black shell. It largely resembles the more common threeridge but has a thinner shell. There are also two rows of protruding knobs located on the umbos of the rock pocketbook which help anchor it in the substrate. This mussel inhabits slow-moving rivers with muddy substrates. 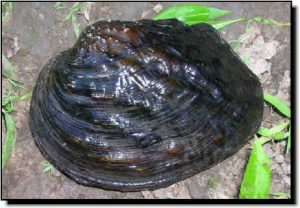 It is a rare Kansas mussel found only in the Marais des Cygnes River and Pottawatomie Creek. Fish Hosts: freshwater drum, white crappie, gizzard shad, channel catfish and American eel.